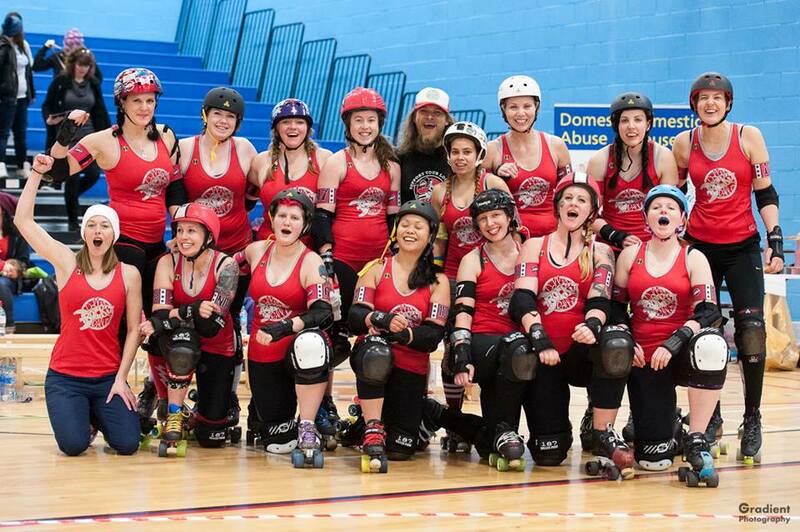 During the latter half of 2014 DRR took six months off playing other teams, to concentrate on ‘Operation Awesome’ – a closed-doors programme designed to maximise skills of current members, and bring newer players up to speed with tactical play and on-track skills. 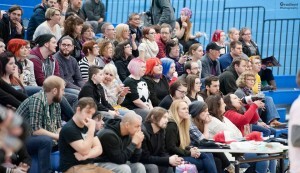 To celebrate the end of OA, and the start of their 2015 season, they invited Rebellion Roller Derby to play at the DMU Leisure Centre, in Leicester City Centre. 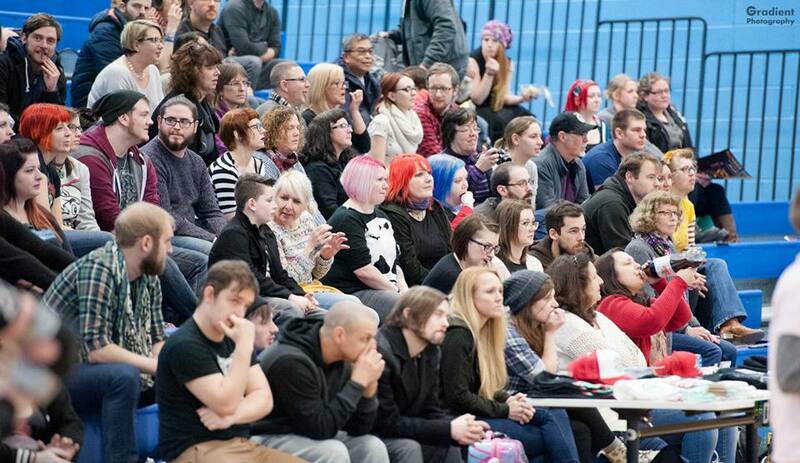 In front of a huge crowd on Saturday 31st January, Rebellion gained lead on first jam and called it 4-0. DRR responded with a strong defense, which allowed their jammer to score whilst the oppositions jammer was held in the pack for two passes. Good use of offensive starts then gave DRR’s jammer another lead, and able to call off the jam with Rebellion scoring 0. 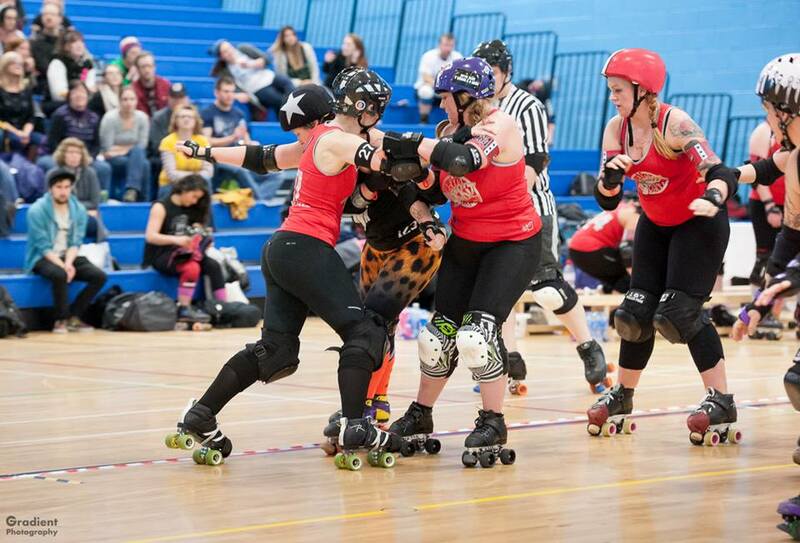 Rebellion fought back well, using a small rotation of strong and agile jammers who charged through walls with ease, and gained a power-jam which saw their score creep up to 25 to DRR’s 59. 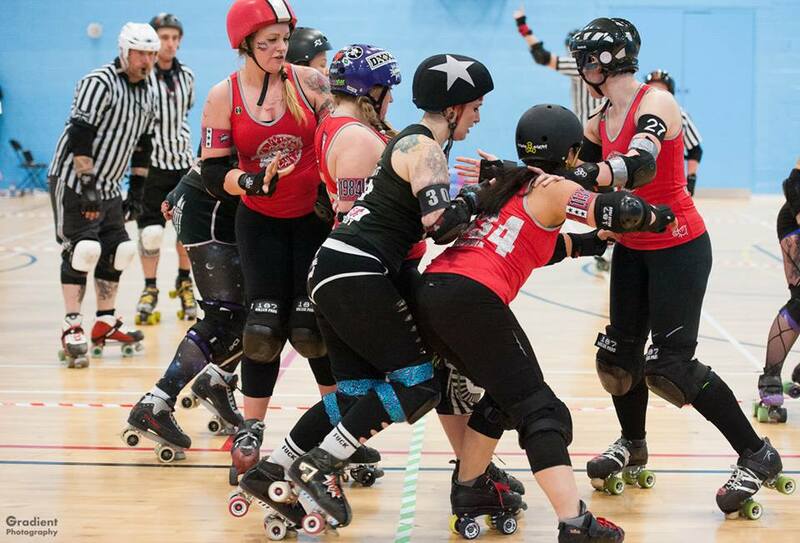 DRR kept advantage using slow defensive walls off the line strong and smart recycling of the RRD jammer to the back of the pack, as DRR’s jammer continued to score, calling it off only when Rebellion’s defence tightened up and trapped her between both teams. 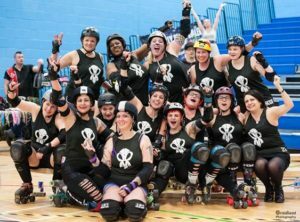 The second half started with DRR 42 points ahead of Rebellion, and the visitors gained lead jammer, but ended the first jam with zero points all round. A fast pack saw DRR’s jammer calling off the next jam after gaining one point, but DRR continued to prosper as Rebellion’s jammer was sent to the box and DRR made the most of this power-jam, finishing this run of good luck at 110-55. 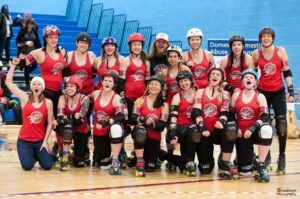 Rebellion’s jammer being sent off for a back block gave DRR another power-jam, and coupled with RRD blockers serving time in the penalty box, DRR capitalised on this situation and continued to score, taking it to 150-63. 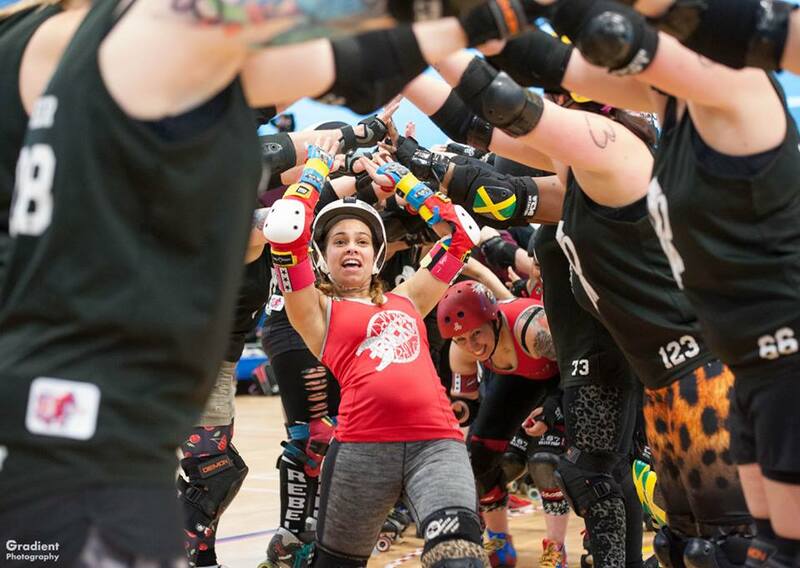 Rebellion fought back valiantly in the next jam, putting on one of their most agile jammers who flew through the pack with ease. 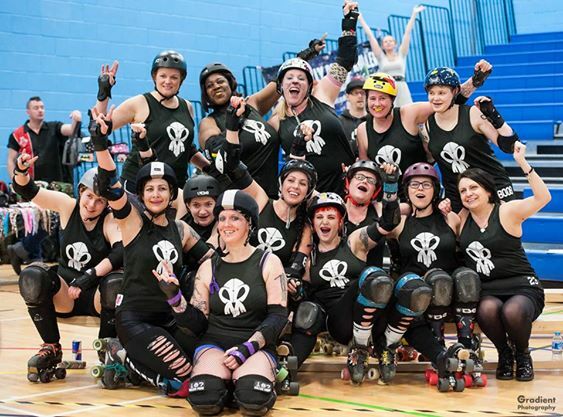 However DRR started on another power-jam and although rebellion got back on track there was no points for them, and the game, which was fast and frenetic finished with DRR winning with 213 – 110. 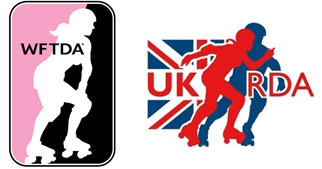 CrossFit Leicester Sponsor Dolly Rockit Rollers! have found something that helped me. Many thanks! Next story DRR celebrate another ‘awesome’ win!